See more objects with the tag figures, ornament, antiquity, royalty, children, royal court, fellow academicians, women, ewers, ornate, hybrid, sculptural, curvilinear, tableware. This is a Drawing. It is dated 1765 and we acquired it in 1911. Its medium is pen and black ink, brush and gray wash on paper. It is a part of the Drawings, Prints, and Graphic Design department. 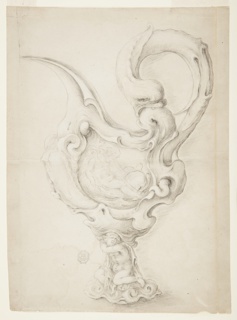 This is a design for a ewer by the Parisian architect, designer, decorator and print maker, Jean-Charles Delafosse (1734-89). 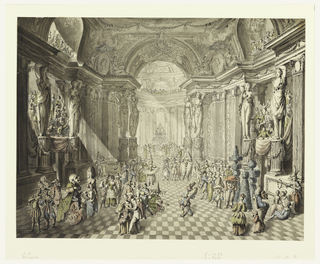 His designs were widely circulated across France, England and Germany and had a profound impact in the development of the goût grec (Greek style), an early form of neoclassicism that emerged in the 1760s. The design modifies the traditional form of an oinochoe, a type of Greek vase used to hold wine or water. Acanthus leaves scrolls across the body of the ewer with festoons of berries, flowers and laurel leaves ornamenting the neck. The handle is a fusion of dramatically arched foliage and a nymph. A satyr embracing a woman perches on the leafy lip of the vessel. These figures are inspired by Italian Mannerist sculpture and metal work as well as by eighteenth-century cabinet pictures. 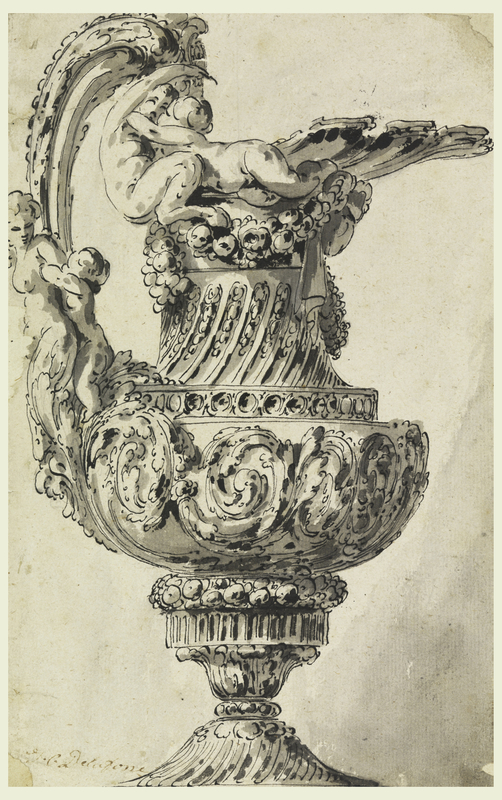 Vases, in particular, were leitmotifs for the Greek style and are nearly ubiquitous throughout Delafosse’s architectural and furniture designs. 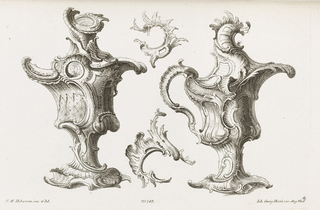 Versions of this ewer are incorporated in emblems and allegories in the Nouvelle Iconologie Historique (1768), a publication that fused the ornamental pattern book and iconological handbook. 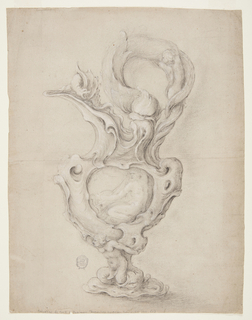 While this specific drawing was never realized in other media nor reproduced in print, it can be interpreted as a case in which Delafosse explored the limits of classical design paradigms by taking a vase as an artistic template. This object was featured in our Object of the Day series in a post titled An Extravagant Ewer: Jean-Charles Delafosse’s Greek Style .